We need more variety of vegetables in our diet. I declared this week to be “fall in love with eggplant” week. I hadn’t yet. After expressing the celebration on our refrigerator complete with color drawing of the vegetable, my kids informed me that an eggplant emoji means something entirely different from the produce I avoided all of these years. It was time to consider this edible object to be more than a killer color or a pervy emoji. We found a recipe that was a perfect start to our week, and by week, I mean a 2-day festival. We turned to Yotam Ottolenghi once again, not because I don’t have any other cookbooks written by authors whose name I can’t pronounce (ahem, Alice Waters), rather he is an eggplant enthusiast like no other and he tends to use a smattering of ingredients that are a perfect pairings that work perfectly on the palate while not being too dependent on any one item. This one leans toward sweet, tangy Asian flavors. Cold noodle salad is incredibly refreshing. 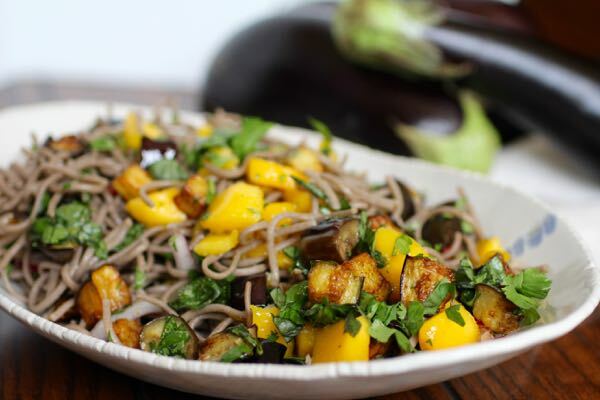 The eggplant in this dish is fried; the author suggesting deep fried. We tried his method and also that with a scant amount of oil in a non-stick pan. Deep-frying was slightly tastier and crisper, but not enough however, to make it worth the additional oil. We also used an Ina Garten (pronounced like garden with a t) trick of adding dressing while the noodles are still warm for flavor absorption. No one screamed, “give me more eggplant,” but the meal was devoured, by kids and adults. It’s a start. Tomorrow night – eggplant with ground lamb and pine nuts. Dr. April says it’s a winner. Any noodle works here if you’re not a fan of the soba. We added shrimp to the dish to make it a substantial meal. In a small saucepan warm vinegar, sugar and salt for up to 1 minute, just until the sugar dissolves. Remove from the heat and add the garlic, chile and sesame oil. Allow to cool, then add the lime zest and juice. Heat up the sunflower oil in a large non-stick pan. Add the eggplant pieces, in separate batches if your pan is on the small side. Once golden brown remove to a colander, sprinkle liberally with salt and leave there to drain. Cook the noodles in plenty of boiling salted water, stirring occasionally. They should take 5 to 8 minutes to become tender but still al dente. Drain and rise well under running cold water but let them stay slightly warm. Shake off as much of the excess water as possible, blot dry on a dish towel. Place the noodles in a mixing bowl, add the dressing to the noodles while the noodles are still warm. 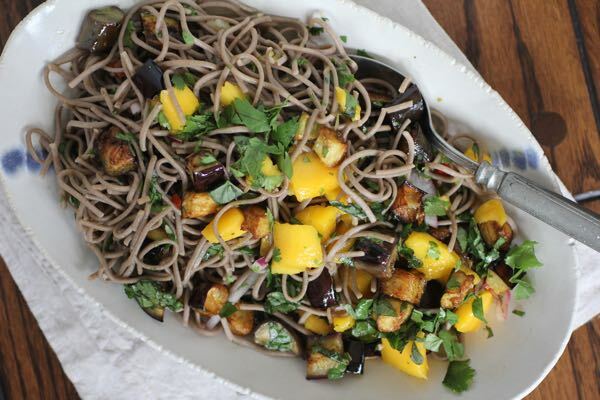 Toss the noodles with the mango and eggplant, half of the herbs and the onion. You can now leave this aside for 1 to 2 hours. When ready to serve add the rest of the herbs and mix well, then pile on a plate or in a bowl.